The Exclusive Edition of the Mercedes-AMG G 63 and Mercedes-AMG G 65 has been showcased at the 2017 Frankfurt Motor Show. 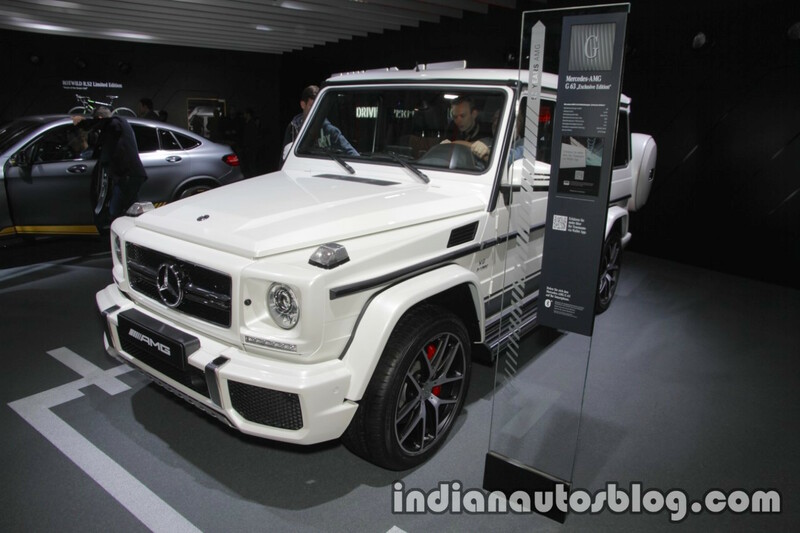 Here are the performance SUV’s (G 63) live images from the show. The two SUVs get stainless steel underride guard; AMG racing stripes on the sides; exclusive light alloy wheels; rub strip inserts in a dark aluminium look and vehicle-coloured a spare wheel cover. The SUVs can also feature the optional AMG Monza grey magno paint finish. On the inside, the performance SUVs get the designo Exclusive package as standard with two-tone leather-trimmed instrument panel and AMG sport seats with two-tone leather upholstery. In both variants, the seat and door centre panels feature a diamond pattern. Customers have a choice of AMG carbon-fibre or black designo piano lacquer trim. The Seat Comfort package is standard, which includes multicontour seats and climate-controlled seats for driver and front passenger. Other options available from the designo manufaktur range include red designo seat belts, leather-trimmed grab handles in the headliner and a two-tone AMG Performance steering wheel matching the seat colours. Powering the Mercedes-AMG G 63 is an AMG 5.5 litre V8 Biturbo engine producing 571 PS of power and 760 Nm of torque. The engine pairs with an AMG Speedshift Plus 7G-Tronic automatic transmission with paddle shifters and three driving modes. The Mercedes-AMG G 65 on the other hand, gets a bigger AMG 6.0-Liter V12 Biturbo engine. It generates 630 PS of power and a massive 1,000 Nm of torque. The powerplant mates with an AMG Speedshift Plus 7G-Tronic automatic transmission. The Mercedes-AMG G 63 Exclusive Edition retails at 163,125.20 Euros, while its bigger sibling, the Mercedes-AMG G 65 Exclusive Edition costs 287,658.70 Euros in Germany.